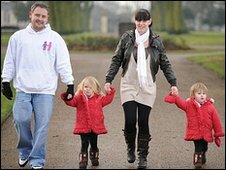 Liberty Rose (second from right) with dad Carl, mum Dawn and twin sister Destiny Mai. A three-year-old girl from Swadlincote who has beaten an inoperable brain tumour is fronting a new national cancer awareness campaign. Liberty Rose Finn, from Castle Gresley, was diagnosed with an optic chiasm glioma  a tumour which coiled around her optical nerve - when she was eight-months old. But she amazed doctors by being given the all-clear after 18 months of treatment. 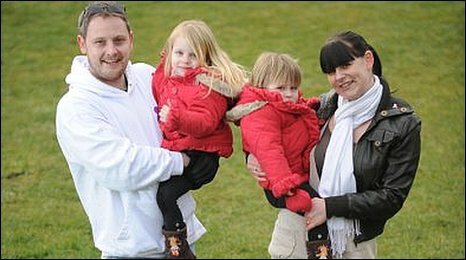 Now parents Carl and Dawn have set up a charity to help other families facing a similar fight. The Liberty Rose Trust unites children from all over the world who are fighting cancer. And Liberty herself is one of a group of young survivors fronting a new campaign aimed at raising awareness about the disease. The charities behind the Be Child Cancer Aware campaign also want to raise money to fund proton therapy which is more accurate and less harmful than existing radiotherapy. Carl Finn told BBC Radio Derby's Shane O'Connor: "There's a huge call for it in this country but we haven't got the machines. "At the moment, parents are having to raise between £150,000 and £250,000 to travel to the United States for life-saving treatment." Carl said he and his wife decided to set up their charity after Liberty was given the all-clear. He explained: "We couldn't just stop there. We didn't want to let our experiences fade away into nothing. "We mainly use Facebook, as well as other social media, to provide day-to-day support for parents up and down the country who are experiencing this horrific situation." Liberty Rose will be one of several children, including Derby's Lewis Mighty, who will provide a face for the national campaign. Carl said: "These children are so inspirational - they take it all in their stride. "Of course they have their down days but more often than not, you'll find them with a big smile on their face."